...the idea of using Dr Jelly Roll and Mr Hyde is to combine the good-guy/bad-guy aspects of Dr Jekyll and Mr Hyde with a musical reference. And Jelly Roll/Jekyll seemed like a good pun. "Jelly Roll Morton (1890-1941). Born Ferdinand Lamothe, he was the first great composer and piano player of Jazz. A talented arranger who wrote special scores that took advantage of the three-minute limitations of the 78 rpm records. But more than all these things, he was a real character whose spirit shines brightly through history, like his diamond studded smile. 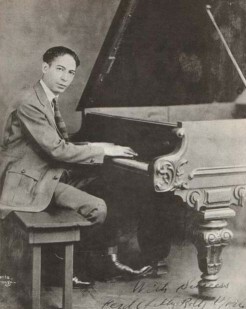 As a teenager Jelly Roll Morton worked in the whorehouses of Storyville as a piano player. From 1904 to 1917 Jelly Roll rambled around the South. He worked as a gambler, pool shark, pimp, vaudeville comedian and as a pianist. He was an important transitional figure between ragtime and jazz piano styles." Quoted from Red Hot Jazz where you can read more about the man and listen to his music.